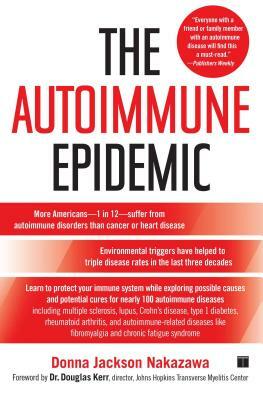 Hailed by Mark Hyman, MD, as “a ray of light and hope” for autoimmune sufferers, this groundbreaking book provides research and solutions for those affected by autoimmune disorders including Crohn’s disease, type 1 diabetes, rheumatoid arthritis, and more. In the first book of its kind, journalist Donna Jackson Nakazawa examines nearly 100 debilitating autoimmune diseases—such as multiple sclerosis, lupus, Crohn’s disease, type 1 diabetes, and rheumatoid arthritis—that cause the body to destroy itself, mistakenly attacking healthy cells as the immune system fights off bacteria, viruses, and other invaders. As Nakazawa share the vivid, heartbreaking stories, including her own, of people living with these mysterious, chronic, and often hard-to-diagnose illnesses, she explores the alarming and unexpected connection between this deadly crisis and the countless environmental triggers we’re exposed to every day: heavy metals, toxins, pesticides, viruses, chemicals in the foods we eat, and more. With the help of leading experts, Nakazawa explores revolutionary preventions, treatments, and cures emerging around the world and offers practical advice for protecting your immune system and reducing your risk of autoimmune disease in the future.